eFoodsDirect, online at eFoodsDirect.com, is our online food source. With your choice of weekly, monthly, or yearly food supplies, you can choose between a wide variety of breakfasts, breads, soups, entrees, and snacks. When you order from eFoods, your pantry will be garden fresh and nutriversal, food will be vegetarian, you will have your choice of freeze dried or dehydrated, the food will cater to your special dietary needs, and so many more benefits. Be sure to check out what eFoodsDirect has to offer and go to RetailSteal.com for all the best eFoodsDirect coupons, eFoodsDirect promotions, and eFoodsDirect deals. Shipping rates at eFoods vary, but they guarantee satisfaction. See website for details. Save 55% over grocery store prices at eFoodsDirect.com. Click link to take advantage of the savings. Free shipping on orders of $149 or more every day when you shop online at efoodsdirect.com. Save 20% on soup and bakery items online at eFoods Direct. Click link to buy. Take 15% off when you buy savory soup at eFoods Direct. Click link to buy now. 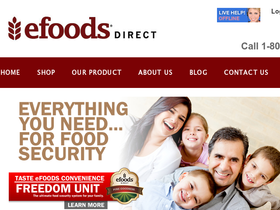 Get a free emergency kit with your $995 online purchase at eFoods Direct. Click link to save. Get 6 free meals and pay only $14.95 for shipping and processing at eFoods Direct. Click link for savings. Visit eFoodsDirect.com and get a week supply of meals for $74.50. Click link now. Be prepared with the Evacuation Pack from eFoodsDirect.com, now $189.95. Click link now to save. Get the Accessory Kit for $109.95 at eFoodsDirect.com. Click link now. At efoodsDirect.com get the grab-n-go accessory pack for a quick fix on the go. Enjoy a 15% discount on purchases from eFoods Direct online when you enter our coupon code at checkout.